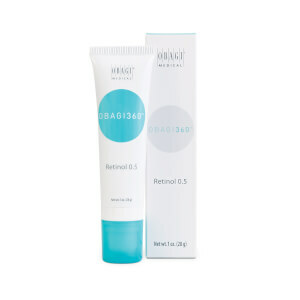 Retinol 1.0 gradually releases retinol, refining the appearance of skin texture and tone for clearer-looking skin. Water (Aqua), Caprylic/Capric Triglyceride, Glyceryl Stearate, Cyclopentasiloxane, Butylene Glycol, Stearic Acid, Butyrospermum Parkii (Shea) Butter, Polysorbate 60, Stearyl Alcohol, Glycerin, Allyl Methacrylates Crosspolymer, Retinol, Polysorbate 20, Dimethicone, Simmondsia, Chinensis (Jojoba) Seed Oil, Chamomilla Recutita (Matricaria) Flower Extract, Hypericum Perforatum Flower Extract, Malva Sylvestris (Mallow) Flower, Extract Salvia Officinalis (Sage) Leaf Extract, Sambucus Nigra Flower Extract, Cyclohexasiloxane, Sorbitol, Tocopheryl Acetate, Ascorbic Acid, Ubiquinone, Sodium Hyaluronate, Propylene Glycol, Bht, Bisabolol, Dimethicone/Vinyl Dimethicone Crosspolymer, Dipotassium Glycyrrhizate, Disodium Edta, Triethanolamine, Carbomer, Glyceryl Acrylate/Acrylic Acid Copolymer, Caprylyl Glycol, Ethylhexylglycerin, Hexylene Glycol, Phenoxyethanol. I have been using this retinol for around 6 months now and the transformation in my skin has been dramatic. At first I broke out in pimples and blackheads but, after reading that this was a normal side effect of retinol, I persevered. I'm so glad I did. It's effective but far gentler than most 1.0 retinols out there - I was expecting redness and flaking but experienced none of the above. A little goes a long way and its consistency is more "face cream" than retinol, so I can often get away with using this alone at night, without additional moisturizer. My skin is firmer, smoother and more even. I am very fair, previously with a lot of melasma (but I have worked hard to get rid of this and I intend to keep it that way!). I love Obaji, but this is definitely my favorite Obagi product. 10/10.